The climb to the summit was quite strenuous and after checking out the Major Mitchell monument and the commercial radio installations I found a place just four or five metres from the top where I could set up my station. Thanks to the 22 amateurs who made contact with me this morning on Mt William. 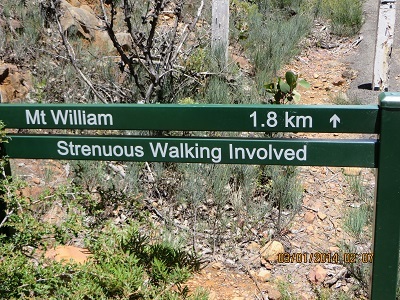 My first contact was with VK3HRA/P3, Allen who was on SOTA summit VK3/VS-001; VK3FPSR, Peter; VK5WG, Nev; VK3AMB, Bernard; VK3DET, Ernie; VK5STU/P5, Stu on Mount Gawler, VK5/SE-013; Vk5PAS, Paul; VK5LY, Larry; VK2DAG, Matt; VK5WG, Nev; VK5NIG/P5, Nigel on SOTA summit VK5/SE-013; VK5CZ, Ian; VK3ANP, David; VK3FPSR, Peter; VK3IL/P3, David; VK3HRA, Allen; VK3AMB, Bernard; VK5MBD, Bill; VK1NAM, Andrew; VK3BHR, Phil; VK3BQ/P2, Andrew in Mount Kosciusko National Park and VK3XPT/P7, Perren at Devonport.